Our 2016 Catalog is Now Available! Our new 12-page catalog is now in print and PDF formats. 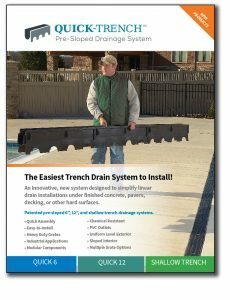 The latest addition to the Quick 6 and Quick 12 family of pre-sloped drainage system is our Shallow Trench drainage system. These channels are 1 meter polypropylene composite sections with uniform exterior and 0.5% sloped or neutral interior full radius bottom for efficient liquid drainage. These new Shallow Trench Channels have staggered semi-circular cutouts on each side at bottom to enable concrete flow under legs. Drainage options include bottom outlet, end outlet, or catch basin. Bottom and end outlet fittings in PVC are sized to accept 3 in or 4 in pipe. Bottom and end outlet fittings are available in PP where chemical resistance is needed. End fittings are universal fit and field trimmed to appropriate height. Grating options include ductile iron, galvanized, stainless steel, and plastic with lock down feature to secure grate to channel. Grate load ratings are available to suit nearly any application and may be specified ADA compliant. Featuring new grates and accessories throughout, updated assembly notes and concrete plans. Visit our site and download the catalog here, or email us to request a printed catalog be sent to you.